ΜΑΡΙΟΣ ΦΡΑΓΚΟΥΛΗΣ - ATHENS REVISITED: Μύθοι και Ήρωες :: TicketServices.gr " // + "
(*)An amount of 2 euros will be added to the price of tickets, which will go to the ''Oloi mazi boroume'' charity. Purchasing your tickets online, and if you have a printer, you may download them in a PDF file format and print them. This way you may enter the venue, without first having to collect your tickets at the venue's box office. 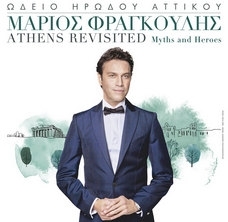 Mario Frangoulis returns once again to the Odeon of Herodes Atticus, this time under the artistic supervision of established artist Lina Nikolakopoulou. The concert is held under the auspices of the New York Times Athens Democracy Forum and its three-day celebration in Athens. Part of the proceeds will go to the “Oloi mazi boroume” charity. Frangoulis will perform songs from his international classical and classical crossover repertoire, including monumental works such as “Carmira Burana”, “Canto General”, “Axion Esti” and “The Birds” and popular films, including "La Vita E Bella", "Dances With Wolves", "West Side Story" "Zorba the Greek", "Schindler's List" and "Blue”. The Orchestra of the City of Athens is conducted by Loukas Karytinos.